The process of land uplift as a consequence of loss of large ice masses is well known from northern Scandinavia and Spitsbergen, where traces of such events including raised beaches can be seen in many places. In Antarctica, it is more tricky as there is not much ice-free land. Precise GPS-measurements have revealed recent uplift dynamics of the northern Antarctic Peninsula. And not just that: while uplift was almost negligible with 0.1 mm/year until 2002, the value jumped up to 8.8 mm/yr – an increase by a factor of almost 90! This is remarkable, both in terms of the development and the absolute value of present land uplift: nearly 1 cm/year is very fast, geologically speaking. The collapse of the Larsen B ice shelf in 2002 has been assumed to be the main driving force behind the land uplift: immense volumes of floating shelf ice broke off the east coast of the Antarctic Peninsula and floated out into the Weddell Sea as large tabular icebergs. The loss of formerly land-based was a consequence of the loss of the stabilizing ice shelf. The result of such an immense loss of weight is isostatic rebound of the crust, leading to land uplift. Geophysical modelling has now shown the ice loss to be insufficient to explain rate and development of land uplift as observed. Movements in the mantle, at 100 km depths and lower, need to be taken into account to explain the data fully. The Bransfield Strait, a small oceanic basin separating the South Shetland Islands from the northwestern Antarctic Peninsula, is a tectonically active area. There are several volcanoes in the area that erupted very recently in geological term, and several fracture zones and plate boundaries. 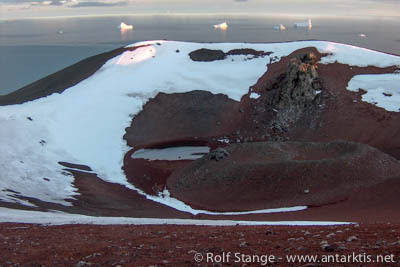 Penguin Island: a young volcanic island in the geologically active Bransfield Strait. Next to volcanism, land uplift is another consequence of these tectonics, amplified by recent deglaciation of the Antarctic Peninsula. The International Association of Antarctic Tour operators has published new statistics of tourism in Antarctica. Numbers for the now finished 2013-14 season are not finalized yet, but preliminary figures indicate a stable development without major changes from previous years. In the 2012-13 season, a total of 34,316 tourists visited Antarctica, a figure not expected to change too much for 2013-14. According to a prognosis for 2014-15, expected visitor numbers of 36,545 indicate a future growth of 6-7 %. There have not been large fluctuations since 2009-10: visitor numbers have largely been stable between 34,000 and 36,000, with the exception of the 2011-12 season, when numbers dropped down to 26,500 following the ban on heavy oil as ship fuel in the Antarctic Treaty area. As a consequence, some larger ships dropped Antarctica as a destination. A good development from an environmental perspective, considering the potentially dramatic consequences of a spill of heavy fuel/crude oil. Out of about 35,000 tourists visiting Antarctica, a large majority of 71 % is travelling to the Antarctic Peninsula with small to medium-sized ships with fewer than 501 passengers. These ships offer landings to their passengers. As the maximum number of tourists ashore is limited to 100, ships with more than 100 passengers offer a rotation system. Ships with more than 500 passengers do not offer landings, they constitute the “cruise only” category, which describes exactly what they are doing (and what not). 27 % of antarctic tourism is cruise only. The proportion of those who visit the interior of Antarctica by flight is small, numbering about 1 %. This includes visits to the South Pole and mountaineering expeditions to Mount Vincent, the highest mountain of Antarctica. Expedition cruise ships at the South Shetland Islands: this is how most tourists visit Antarctica. 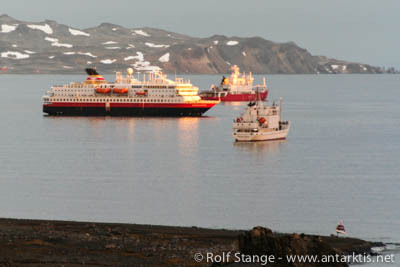 MS Nordnorge to the left, MV Grigoriy Mikheev (not operating anymore) to the right. A governmental supply ship in the background.